With a unique combination of spectacular grounds overlooking the Humber River Valley and a world-famous art collection, the McMichael provides an unmatched backdrop for children, youth and family programs. 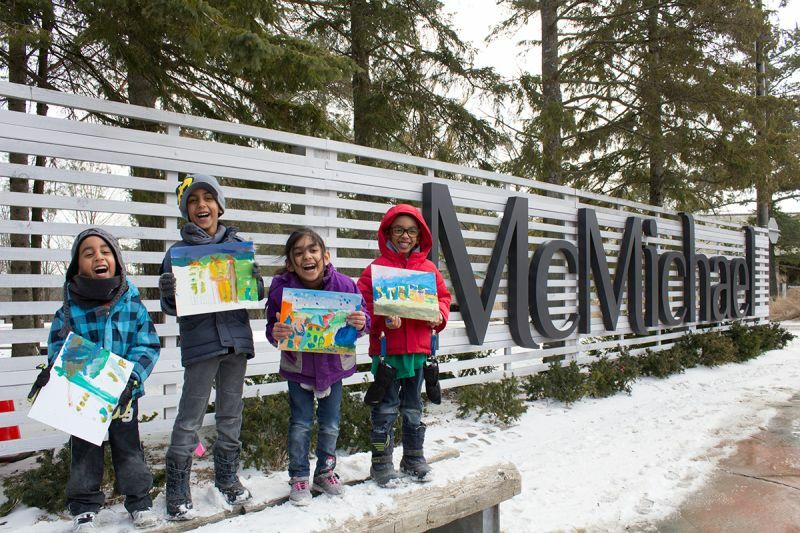 For details on March Break and Summer Camps, Children and Youth Art Classes, Accessible Studio Workshops, and Family Days and Festivals, visit mcmichael.com today! The McMichael facility is, frankly, as much of a national treasure as the art that it houses. You really can’t praise it enough—it’s truly a jewel in the crown of Canadian arts. In addition to year round programs, the summer sessions, in particular, unabashedly get kids involved up to their elbows in art, from creation to appreciation. The sessions are active, though created to really promote the work and the collections to kids on their level, inspiring them to better appreciate their talents as well as the talents of those around them. The experience of being at the collection, too, creates a sense of ownership for the works collected there. The gallery intentionally blurs the line between art and environment, and the camps seek to extend that, getting kids out into the world, and to see how that world is reflected in the work of some of the country’s greatest artists. These camps are not just art classes or art appreciation workshops, they are vibrant, well-led programs allowing kids to have fun while interacting with others around the arts. Visit the McMichael on Family Days and during festivals to take part in a variety of drop-in art workshops, tours and performances. My daughter was enrolled in some other art classes but none compared to this one. She was always so excited to go to class and happy after each one. My daughter liked everything about the program, learning all the tips and tricks on how to draw and paint. She loves art even more now. Very approachable and skilled instructors, ready to answer questions and concerns at any time. Very involved and helpful with the kids. This was a wonderful day and we would be very interested in future programs. The setting away in the Pine Cottage was perfect for these kids and the overall setting of the grounds was spectacular! I was very impressed with various information, not only on arts, but also on nature and artists. Also the level of care is beyond my expectation and very impressed. Thanks a lot. Kids loved the camp. They would like to go again next year. Good combination of indoor and outdoor. Every day was exciting for them. We were blown away with the quality of the art work produced this week. My daughter loved camp and is thrilled that she gets to go for a second week. She also loved the games and activities that were done in addition to art. Both [my kids] said it was one of the best camps they had been to. Thank you again to the entire ArtVenture team for providing a wonderfully creative, dynamic, and engaging summer camp for art lovers! My boys have been returning to this camp year after year and have always returned home with a renewed passion for the arts. What a fantastic way to spend your summer! My daughter enjoyed digital photography because she loves exploring nature and was glad to be able to capture it. My daughter had an amazing time and brought home beautiful art work paralleling Canadian great artists! What I love most about the McMichael's art camps is that my children experience first-hand, the connection between art and nature. The fresh air, beautiful grounds, and first-class art collection are inspiring any time of the year. My daughter has attended in the past, but this was her favourite by far. The instructors and assistants are amazing and took the time if my daughter needed help. You made art fun again! A variety of activities that keep participants engaged...approachable, open and encouraging - for any age group. I love this program and the place. I love all the staff and instructors. The quality of art education is high here compared with other places I've tried. Interested in McMichael Children and Youth Art Camps and Programs?